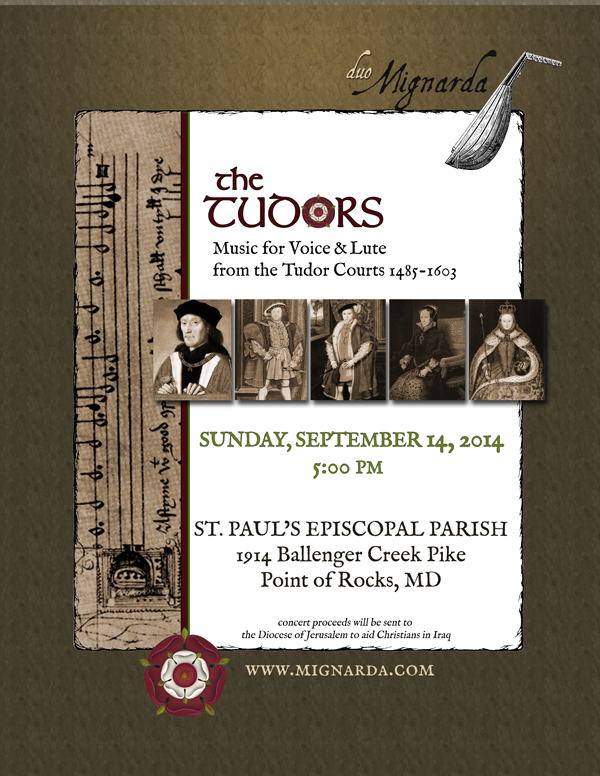 Internationally-renowned duo for voice and lute, Mignarda, presents a guided tour, time-travelling through 118 years in a single afternoon as they trace the musical influences of the colorful and musically-gifted Tudor monarchs. The Tudors, who reigned from 1485 until 1603, were trained in music from childhood and were accomplished lutenists, singers, and even composers. And more importantly, the Tudors employed legions of Europe's finest musicians, French, Flemish, Spanish and Italian. A pastiche derived from an expanded four-concert series, the concert program offers a rich sampling from the bounteous Tudor musical legacy. Beginning with the mesmerizing rondeaux of the time of Henry VII, romp through the lusty fare of Henry VIII's tempestuous court, followed by the serenity of sacred music favored by the devout "Bloody Mary", finally reveling in the lush and familiar songs of loyalty, love and longing from Elizabeth's Golden Age. "Congratulations on a really exquisite rendering of your selection from 'Pilgrimes Solace'! Donna, I love your expressive, plaintive quality - and such intelligence shines behind every word and sentiment." Thanks for your way to make music: it's full of good taste, that is something rare in this strange world of the "early music". And thanks to the singer, for her beautiful voice and elegance. "My other band crush this year is Mignarda. What can I say? Ron Andrico and Donna Stewart have captured my heart. The depth and emotion in their playing is nearly overwhelming. I have learned a lot from them and we've made some stunning recordings together. You need to hear this. It will change you..."
"Your music was very moving as were the two of you interacting musically & otherwise. Entirely appropriate to the gentle nature of the music itself, but also a tribute to the wonderful sensitivity which you bring to it." Donna Stewart & Ron Andrico, better known as Mignarda, are one of the few professional lute song duos in the US. Dedicated to music of the 16th century, Mignarda's engaging approach has set a new standard for interpretation, authenticity and musicianship. Based in rural upstate New York, Mignarda performs throughout the US with an international audience for their ten critically-acclaimed recordings and a growing series of editions of historical music for voice and lute. Mignarda's CD, Divine Amarillis, received the 2009 JPF Best Classical Vocal Album Award, and the duo maintain an active schedule in touring, recording and teaching. In addition to live performances, their music has gained international exposure through radio and television broadcasts across the US. Mignarda specialize in performing music that resides in the grey zone between folk and art music, with interpretations that follow the renaissance ideal of 'moving the passions' of the listener. They recently celebrated their 10-year anniversary with release of their 9th CD, music from John Dowland's A Pilgrimes Solace.